I’ll admit that I haven’t made many Indian dishes. I guess I’ve been nervous about some of the flavor profiles. I’ve had curries that I like and others that have been less enjoyable. Maybe that should have inspired me to try my own spin on Indian sooner. If I’m making the dish, I can control the amount and type of spice. It may not be an authentic Indian dish, but it could be close enough to be loosely categorized as such. With this thought in mind, about a month ago I decided to try my hand at a couple Indian dishes. 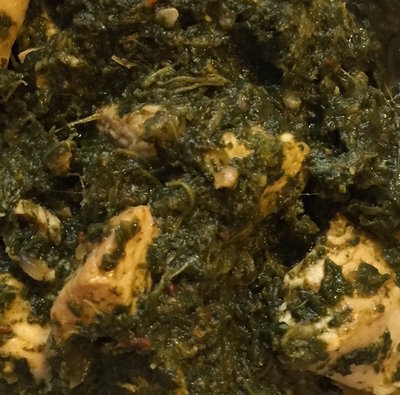 Among the menu was this saag dish, cooked with chicken instead of turkey. The initial version used uncooked chicken, which poaches in the pan. With Thanksgiving and leftover turkey in mind, I have reworked the dish. Simply dice up your turkey meat (white or dark works) and add it at the very end. All it needs is a minute or two to warm, and dinner is served. If you’re like me and hesitant to step into the world of Indian cooking, this dish is the perfect introduction if you’re a fan of cooked greens. Alter the spices to please your palate, happiness is sure to abound! Heat olive oil in a nonstick frying pan over medium heat. Add butter. When the butter begins to foam, add the onion, jalapeno, garlic, cumin, cardamom, and paprika. Sauté until tender, approximately 5 minutes. Transfer to a blender or food processor; add broth and spinach, and purée. Return to frying pan, and bring to a boil. Reduce to a simmer and add turkey. Heat for 2-3 minutes or until turkey is warmed through. *For less heat, remove seeds and ribs. **If using raw chicken or turkey, heat for 6-7 minutes and it is thoroughly cooked.